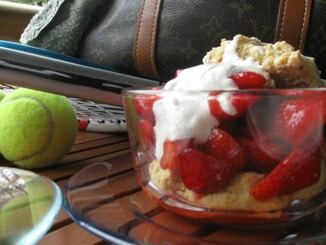 Breakfast at Wimbledon, July 4th brunch or any summer celebration, this Strawberry Shortcake recipe is a winner. Rinse and pat dry strawberries. Remove stems and cut in quarters. Place in a medium bowl and toss with sugar and lemon juice. The sugar will bring out the juice from the berries, creating a a little sauce and the lemon juice brings out the sweetness. Place the bottom half of a shortcake on a small plate or in a bowl, top with berries, pour cashew cream over the berries and cover with the top of the shortcake. Sprinkle powdered sugar on top. Makes about 6 individual strawberry shortcakes.